Steyning Grammar School sixth form celebrated a record-breaking exam season this morning as 98.8 per cent of students passed their A-levels. Eva Bizas moved to Storrington from Athens four years ago and said she could barely write a paragraph of English. But now, she is celebrating getting an A in Greek, B's in sociology and English literature and a D in music. She said: "It was very challenging at first, I must say, but when you are surrounded by English all the time it is kind of amazing how your brain works, because you pick it up." She received an unconditional offer to study education at the University of Brighton, with a view to becoming a primary school teacher. Eva said: "My advice to foreign students would be to make English friends, because many people who come here stick with people who speak their language." She was joined on results day by her best friends Katie Thibaut from Henfield, Kate Meheux from Lancing, Amy Timmins from Henfield and Charlotte Veale from West Chiltington. Charlotte will be going to St Catharine's College at Cambridge University to study natural sciences after getting A*s in biology, chemistry and maths and an A in further maths. When asked what the secret to her success was, the 18-year-old was lost for words - so her friends stepped in to help her. Kate said: "She is so driven and clever, and is such a hard worker - and very modest!" Kate also had something to celebrate after getting two As in economics and maths and a D in further maths - enough to secure a place at the University of Sussex to study economics. She sang the praises of the staff at Steyning Grammar. 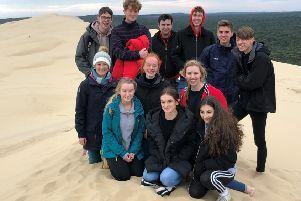 She said: "It has been incredible here; it has been a super intense two years but I wouldn't have got through it without the staff and my classmates. "I have been at Steyning for seven years; it has been my home and leaving will be really difficult." After getting a B in maths, a C in dance and a D in further maths, Amy will be pursuing her childhood dream of becoming a choreographer, inspired by her mother, who was a dancer. She will be studying at the Trinity Laban Conservatoire of Music and Dance in Greenwich. Katie received unconditional offers from the Universities of Plymouth and Portsmouth to study marine biology before she got her B in biology and Ds in chemistry and geography. She said: "I was happy with some of them. They weren't as good as I was expecting, but the exams were really hard." Her mum Amanda Thibaut said: "I'm just really pleased that she got into uni because she has wanted to do this course since she was a little girl." Her dad Neale added: "We are both so proud of her." Isla Martin, 18, from Thakeham, got a C in English language and a D1 distinction, the equivalent of an A*, in BTEC sport. She said: "I'm very happy; can't complain." She said she was 'working her socks off' to save money so she can work with horses - her dream career path. Lisa McLaughlin, 18, from Lancing, got an A*, A and B and will be going to the University of East Anglia to study philosophy. She said: "I instantly cried; I was really surprised. I had no idea what to expect, but I didn't expect to be that happy. I would have been happy with all Bs." Her proud mum Lynda said she had fought for her daughter to get the best education, taking her to schools outside their catchment area. She said: "I'm a great believer in getting a good education right from the get go, no matter where you live, and I'm so proud of her. At the end of the day, it is her willingless to learn that let her succeed." Sally Randall, assistant headteacher and head of the sixth form college, and headteacher Nick Wergan, were also proud of their students; watch the video above to see what they had to say. To find out more about A-level results across Sussex, read our blog.